Well, this weekend I’m headed out on a road trip…. I’m driving about 12 hours in my petrol powered automobile to participate in a bicycle ride that had its origins as a protest against fossil fuel use… Am I being a hypocrite? Well seeing as there’s no nearer WNBR to me as the Sydney one can’t get police approval (threats of arrest are real) if I flew by plane it would use a lot more fuel than my 4 cylinder car would anyway. 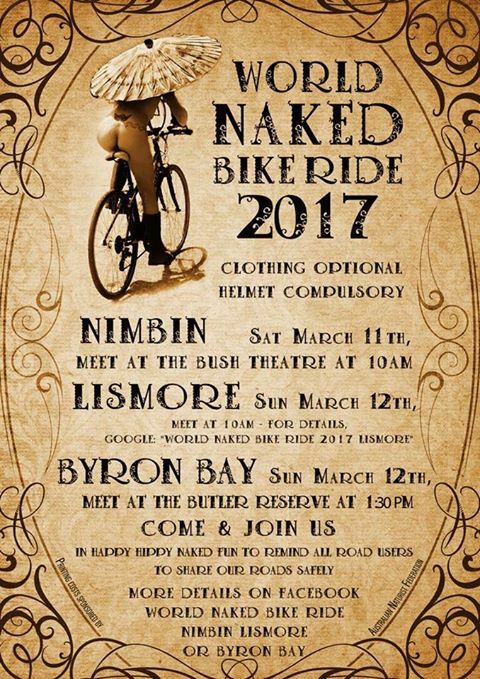 Here’s an article about the Byron Bay as well as Nimbin & Lismore rides this weekend. I’m planning on doing a few live Facebook videos (have to be careful where I point my camera!) as well as having a GoPro camera running on my bike, so watch this space! 2) Make sure the bike tyres are in a good state, I had pumped up the tyres a month before the ride and the front was a little low but when I pumped it up before leaving home it seemed ok and was low again when I got to Byron so I pumped it up again on the morning of the ride and thought “She’ll be right mate” However 10mins before the start it was dead flat, so as everyone was assembling to start the ride I pumped it up again with my electric pump… Then 5mins later it was flat so I had to push it around the streets (that’s the rattling/flapping noise in the video. But it was a fantastic day… thousands of people filled the streets with their camera phones pointed at the 240 or so riders/skateboarders/walkers as we did two laps of Byron Bay township. I not once saw an angry or offended face and no children where harmed by seeing naked bodies. There was a great diversity of people there, old/young large/small all celebrating the freedom and even the cars trying to get through the streets gave way to cyclists which was the main aim of the event to draw attention to the fact that bikes are vulnerable. Looking forward to the next one on Sunday 11th March 2018!